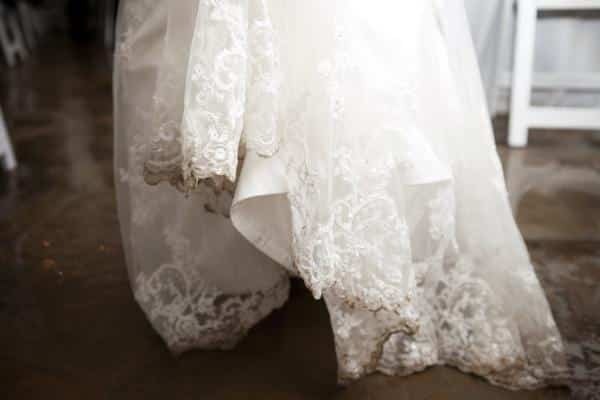 Did you know that the hemline of your wedding gown gets the most wear and tear on your big day? The reason is that most dance floors are wood or parquet. They are oiled to keep the shine and to make them look more appealing. However, when you dance, the hemline of your gown picks up some of the oil and will mix with the dirt on the floor from the bottom of your guest’s shoes. Getting married on the beach you have different problems from the salt water and other stains that will be picked up. You can’t always see the stains, but the dirt works into the fibers and stains the bottom of your gown. It is good to point this out when you bring your gown in for cleaning or preservation. Any floor dirt, such as grease, grass, tar (to name a few) are all addressed through hand cleaning before the entire gown can be cleaned. Depending on the skirt size and amount of dirt this part of the cleaning can take any where from 1-2 hours making it very labor intensive. If the dirt does not come out with the first cleaning it will have a second cleaning. To help make this process easier on your gown bring it in as soon as possible after your big day. The longer stains set the harder they are to remove. And because the fabric on wedding gowns is very delicate, we don’t want to damage the fabric.